Your internal clock doesn't just turn on at night - your circadian rhythm is at work throughout the day, and Michael Breus wants to help you make the best of it. The power to reaching our potential lies in focusing more on when we do things, not just what we need to do, and most of us are actually sabotaging ourselves, fighting against our natural rhythms, or chronotype. Discover your chronotype and learn to live in sync with it to work and feel better. 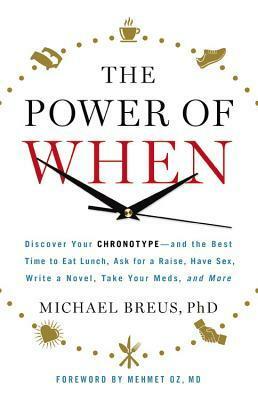 An interesting premise, Breus' ideas help give you power over your daily routine rather than being overpowered by it. First, you take a quiz (Fun! I love quizzes!) to determine your chronotype - Dolphin, Lion, Bear, or Wolf (Double fun! Cool chronotype names!). The remainder of part one profiles of each chronotype and breaks down how an ideal day as a Dolphin/Lion/Bear/Wolf would look according to Breus' suggestions. Part Two elaborates on the best time for certain tasks (exercise, making plans, approaching different tasks at work) by topic, with advice for all four chronotypes. Part Two gets a little repetitive, but Breus does a good job of getting right to the point and including fun facts, so whether you're reading through or just skimming for your chronotype, you won't get bogged down. What I like most about this book is that Breus, a clinical psychologist, is an academic, has done his research, and is careful to note that you should always consult your doctor and follow their direction over any suggestions in this book. I'd recommend this book to anyone who feels ruled by the almighty 8-5 work day and/or frustrated at their energy levels throughout the day. The chronotype model is pretty general, and the schedules do favor the typical 8-5 work day, so while the details may not exactly fit your lifestyle, the main principles do. Quick testimonial: My chronotype is a Wolf, described by the author as "...night-oriented creative extroverts with a medium sleep drive." In short - not morning people. I haven't adopted the full suggested schedule, but I have tried a few things. In particular, the waking-up strategy recommended for Wolves has seriously helped, and it feels great to not wake up automatically enraged at my alarm clock/the sun/the universe itself.